Lee Ann of The Butter Compartment created this super fun idea! 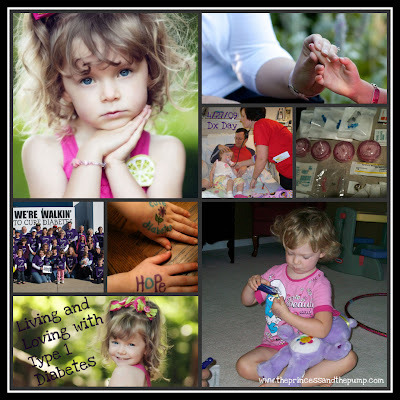 Here's what she has to say... "I am initiating the very first official Diabetes Art Day. If you would like to participate, between now and September 1st, I’m asking you to break out of your linguistic comfort zone, bust out some art materials, and make a piece of artwork – painting, drawing, collage, sculpture, an installation piece, a mixed media something or other, or whatever you can imagine." She asked to paint while hanging out in my classroom after school the other day. She favors abstract paintings. She rarely likes to actually paint "something". She prefers to paint with lots of colors in pure abstraction. She didn't bat an eye. To her, old test strips were just as good as any other art supply. She grabbed the white glue and went to town! I guess that just goes to show that, at least to Sweetpea, diabetes and diabetes supplies are just a normal, everyday part of life. 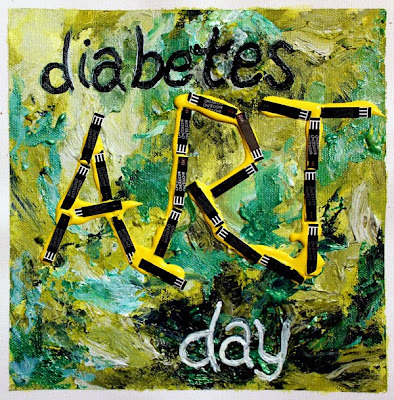 Here are Sweetpea's pieces of art for Diabetes Art Day 2010! Personally, I am most touched the art of photographs. So I made my own piece of "art" in honor of Diabetes Art Day. I know bloggers all over the DOC are participating today! Stop by and check out their art! * I apologize if I missed anyone! Let me know and I'll add you to my list! ** I know the musical accompaniment was a stretch today! There is just no good songs out there to go with art! So... "Draw the Line" by Aerosmith was as close as I could get. It kinda fits... and I like the song! Enjoy! Aw, your little girl is definitely the best "art supply"! She's adorable! Love the use of test strips as an art material! Great job Sweetpea! Love your photograph art too. Awesome work, Sweetpea! I love all of that art! And I love the photo collage too Hallie! Oh by the way... I haven't been around much so this is the first time that I'm seeing the new design of your blog.... love it! SO cute! The paintings and the collage! Beautiful paintings & collage. Nice work! I love Sweetpea's use of color! I hope she keeps going and paints and glues to her little heart's desire! WOOT WOOT GO SWEET Pea!!! and of course I love the photography...that is what I was relying on for my pathetic project of Irony...LOL. I love how this project brought us all together in the D-OC. Just.LOVE.It. The pics are so beautiful! You have an artist on your hands. :) Great picture collage too. Thanks for including me on your list, Hallie! I was doing a good job of keeping up with all the posts this morning and then life got in the way and I derailed. It will take me a couple of days to catch up I think. There are no many great projects out there and yours and SweetPeas are no exception! I absolutely love her paintings!! Maybe I'm a tad bit biased, but her process for working sounds so much like mine, LOL! They are beautiful paintings, and I'm glad she saw the strips as meaningful enough to add to her paintings. I also appreciate how she was very meticulous in how she arranged them. She clearly put a lot of thought and effort into her work. Your photo collage is great too. I really like the the selection, how they complement each other, and how they convey a variety of aspects of your life with diabetes.